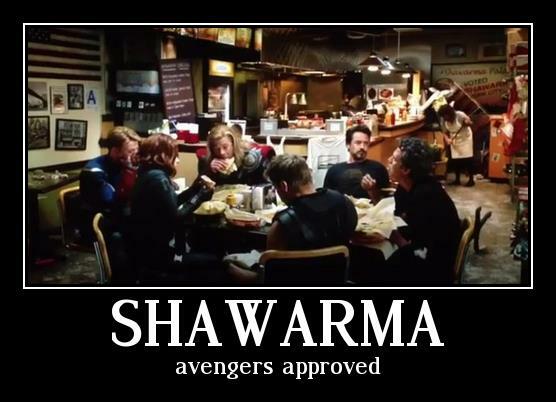 Is shawarma benefitting from an "Avengers" bump? In the recently released film, Iron Man (played by Robert Downey Jr.) suddenly craves the flavorful, spit-roasted Middle Eastern street food after a major battle scene. "Have you ever tried shawarma?" Iron Man asks Captain America. "There's a shawarma joint about two blocks from here. I don't know what it is, but I want to try it." After the film's credits roll, the superheroes can be seen (possibly during a filming break?) silently chowing down on shawarma. In the YouTube video above, the theater audience explodes in cheers and laughter at the sequence, with one movie-goer saying, "Wow. They actually went!" Now local shawarma restaurants seem to be having a "moment" -- at least according to an informal poll by TMZ. Ro-Ro's Chicken, a Hollywood shawarma joint, told TMZ that sales have shot up 80 percent since the movie opened.